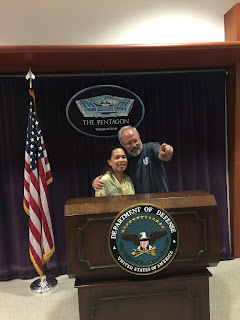 I've been wanting to visit the Pentagon ever since, so that when Rill's Bus offered the tour, I and my husband signed up for it. The tour was approximately an hour duration with a walking distance of about 1.5 miles through all the Pentagon's corridors and staircases. So, there was a lot of walking. You need to wear shoes that are comfy. The tour is a dynamic one; - it highlights the mission of the Department of defense, explains and shows the historical facts pertaining to each of its branches of service, and showcases numerous displays that highlight and depict those significant moments in military history. The highlight of the tour was a visit to the memorial placed inside the Pentagon near the Sept. 11th Memorial Chapel. The Hall of Heroes can also be seen wherein names of all the recipients of the Medal of Honor are on it, as well as an up-close look at an actual Medal of Honor. Take note however that what you see inside, stays inside, which means strictly no photos allowed! No large bags, pointed instruments and other potential weapons that can inflict bodily harm. Cameras and cellphones are permitted but should be turned off. Cameras are allowed at the lobby/visitors area though, so get a good photo there ;). The Pentagon is one of the world's largest office buildings and is the headquarters of the Department of Defense. Before taking a Pentagon tour, all visitors are required to provide their full name, address, DOB and SSN. For non-US citizens, your citizenship and the name of your country should also be provided.